Every successful marketing campaign is comprised of several key elements that work in tandem to bring a website into the top percentages of Internet search engine results. Three of the most commonly used (and most effective) key elements in online marketing campaigns are Search Engine Optimization (SEO), Social Media Optimization (SMO) and Search Engine Marketing (SEM). Search Engine Optimization (SEO) is the process of optimizing the content of a website to increase its visibility within the search engines. A few of the ways SEO is implemented into a website’s design are making necessary changes to is source code, using meta tags easier indexing of the site and filling the website with quality, unique content that has been created around some well-researched, relevant keywords. Search Engine Marketing (SEM) refers to the practice of incorporating strategically placed ad campaigns – such as pay-per-click advertisements and banner ads – into the website’s end design. These ad campaigns work with the search engines to direct relevant traffic to a website, based on search terms entered by search engine users. Social Media Optimization (SMO) entails integrating your marketing efforts with your influence on various social media platforms, such as Facebook, Pinterest and Twitter. There are many ways of incorporating SMO into your online marketing campaign, such as promoting a new product or service via your Facebook page, tweeting a link to your most recent blog entry or by sharing a relevant picture with a link back to your website on your Pinterest account. The great thing about SMO is that its reciprocal, meaning that the more you engage people and share their content, the more likely they are to respond in kind, thereby extending your brand’s reach even further. While it’s true that any one of these methods can increase your website’s exposure on its own, harnessing the power of all three can almost guarantee the success of any online marketing campaign. This invaluable arsenal of online marketing strategies has the ability to expose your website to millions of Internet users each and every day while opening doors to other markets that were not previously within your reach. 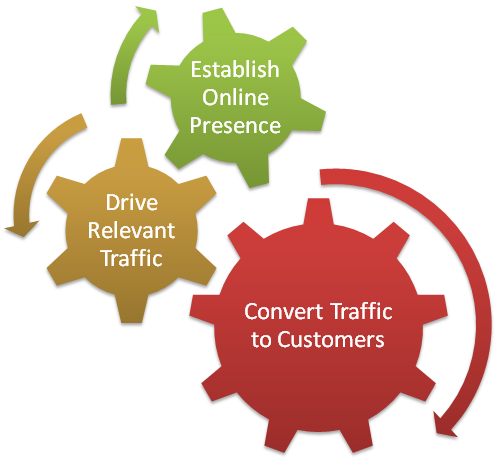 These three key optimization strategies are only a small portion of the services Digital Presence Solutions provides. Unlike other SEO firms, we do not operate off a standardized price list. We recognize that our customers’ needs are as unique as they are. That’s why we work closely with each of our clients to tailor an online marketing plan that not only meets those needs, but exceeds them as well. Contact us today for your customized online marketing proposal and personalized project quote.